Life as a Gypsy: Have you met Jasper the Bear? Jasper the Bear is a landmark for the town. 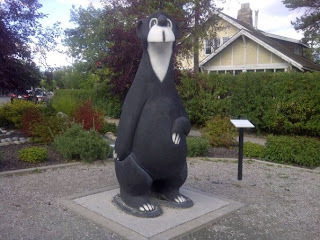 Created by James Nathaniel a Canadian cartoonist from Winnipeg, his cartoon character of Jasper the Bear was famous throughout Canada from 1948 to 1972 and remains as the mascot of Jasper National Park. In 1962, Jasper was adopted as the official mascot for Jasper National Park in Alberta erecting a statue of Jasper at the Train Station where it remains to this day. Today it stands to the right of the visitor centre and, Jasper the Bear is as tall as 6'-7' feet. It is customary to visit Jasper the Bear only if you are just passing through or staying for a couple nights. It is one of those landmarks, so do not forget to take your camera with you when you visit Jasper the Bear.